Systems integrator Encore Broadcast Solutions in Winter Springs, Fla., recently installed Hitachi Z-HD5000 cameras at three churches: First Presbyterian of Orlando, First Presbyterian of Bonita Springs and Faith Assembly of God in Orlando. First Presbyterian Church of Orlando worked with Encore last year to upgrade to HD. The church streams a formal service from the main auditorium to a 16’ x 9’ screen in a smaller room nearby that seats 300 people and to the Web. “Ultimately, you’re spending a bit more money for much better quality that will be seen on many computers and televisions. To enhance the Web viewing experience of the church’s followers, we chose high-quality video equipment while keeping a budget in mind. Hitachi’s Z-HD5000 was an ideal pick for the church,” said Cameron. 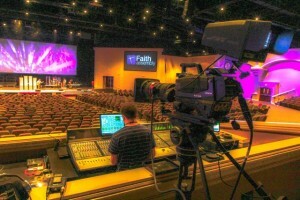 “From HD images on screens in our traditional service, to HD broadcast of our contemporary service, and live HD streaming to our website, the high-quality imaging we capture with our Hitachi cameras stood out to our congregation immediately,” said First Presbyterian Church Technical Arts Director Richard Swinson. First Presbyterian of Bonita Springs, Fla., also upgraded from small consumer cameras to the Hitachi HD. As part of the overhaul, Encore built a control room out of the church’s attic. Because the control room wasn’t near the main auditorium, they needed cameras with digital optical fiber CCU that allowed them to use I-MAG to broadcast sermons. Three Z-HD5000 cameras equipped with optical fiber and Fujinon lenses are installed in the main auditorium of the church. The project included building a video and sound system in the church’s overflow room. Faith Assembly of God in Orlando, Fla., also worked with Encore to build its new campus. Three Hitachi Z-HD5000 cameras were installed in the main sanctuary’s 2,700-seat auditorium. Two of the cameras are equipped with Angenieux telephoto lenses and set in the sound booth in the back of the auditorium. The third is on a jib equipped with a Canon wide-angle lens. Faith Assembly streams its services and concert productions to reach its audience in multiple continents.